Messier 110, also known as NGC 205, is a dwarf elliptical galaxy that is a satellite of the Andromeda Galaxy. M110 contains some dust and hints of recent star formation, which is unusual for dwarf elliptical galaxies in general. 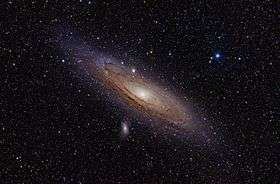 Although Charles Messier never included the galaxy in his list, it was depicted by him, together with M32, on a drawing of the Andromeda galaxy; a label on the drawing indicates that Messier first observed NGC 205 on August 10, 1773. The galaxy was independently discovered by Caroline Herschel on August 27, 1783; her brother William Herschel described her discovery in 1785. The suggestion to assign the galaxy a Messier number was made by Kenneth Glyn Jones in 1967. Unlike M32, NGC205 does not (as of 2005) show evidence for a supermassive black hole at its center. ↑ A.W. McConnachie; M.J. Irwin; A.M.N. Ferguson; R.A. Ibata; G.F. Lewis; N. Tanvir (2005). "Distances and metallicities for 17 Local Group galaxies". Monthly Notices of the Royal Astronomical Society. 356 (4): 979–997. arXiv:astro-ph/0410489 . Bibcode:2005MNRAS.356..979M. doi:10.1111/j.1365-2966.2004.08514.x. ↑ J.L.E. Dreyer; R.W. Sinnott (1988). R.W. Sinnott, ed. NGC 2000.0: The Complete New General Catalogue and Index Catalogues of Nebulae and Star Clusters by J. L. E. Dreyer. Sky Publishing Corporation and Cambridge University Press. ISBN 0-933346-51-4. 1 2 3 4 5 6 7 8 9 10 11 12 "NASA/IPAC Extragalactic Database". Results for NGC 205. Retrieved 2006-11-29. 1 2 A. Sandage; J. Bedke (1994). Carnegie Atlas of Galaxies. Carnegie Institution of Washington. ISBN 0-87279-667-1. 1 2 K.G. Jones (1991). Messier's Nebulae and Star Clusters (2nd ed.). Cambridge University Press. ISBN 0-521-37079-5. ↑ K.G. Jones (1967). "Some New Notes on Messier's Catalogue". Sky & Telescope. 33: 156–158. Bibcode:1967S&T....33..156J. ↑ van den Bergh, S. (2000). "Updated Information on the Local Group". Publications of the Astronomical Society of the Pacific. 112 (770): 529–536. arXiv:astro-ph/0001040 . Bibcode:2000PASP..112..529V. doi:10.1086/316548. ↑ ""Forum di Astronomia Amatoriale Italiano"". ↑ Valluri, M.; Ferrarese, L.; Merritt, D.; Joseph, C.J. (2005). "The Low End of the Supermassive Black Hole Mass Function: Constraining the Mass of a Nuclear Black Hole in NGC 205 via Stellar Kinematics". Astrophysical Journal. 628 (1): 137–152. arXiv:astro-ph/0502493 . Bibcode:2005ApJ...628..137V. doi:10.1086/430752. Wikimedia Commons has media related to Messier 110. Fohring, Dora; Merrifield, Michael. "M110 – Dwarf Galaxy". Deep Space Videos. Brady Haran.